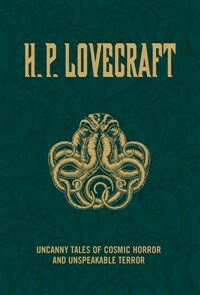 This mammoth anthology of Lovecraft horror contains some of his scariest stories such as "The Call of Cthulhu" (a terrifying tentacled alien god); "Herbert West - Reanimator", about a man who can bring people back from the dead; "The Rats in the Walls"; and "The Dunwich Horror", among many others. Lovecraft claimed to base his stories on the strange and disturbing dreams from which he suffered. Don't dare dip into this book unless you want to share in Lovecraft's nightmares! Howard Phillips Lovecraft was born in Providence, Rhode Island in 1890. A sickly child, he barely attended school but read a huge amount. His ambition as a young man was to become an astronomer, but he lacked the qualifications to go to university and ultimately turned to writing and editing. Although he was not famous as an author during his lifetime, his status as one of the great twentieth century horror writers grew after his death from cancer in 1937.